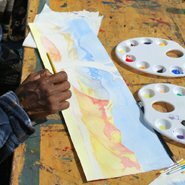 Join artists from Ngarratjuta Many Hands Art Centre in Alice Springs to learn more about watercolour painting techniques and materials. Then try your hand at creating a small landscape painting of your own. Although this is a free event, places are limited. Reserve your place in one of the half-hour sessions by picking up a ticket from the information desk from 1pm on the day.